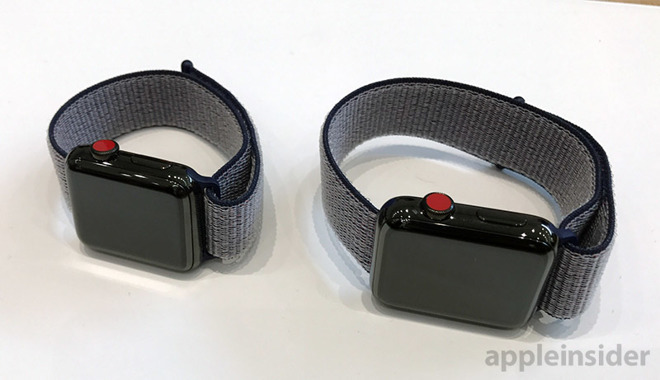 Apple Watch Series 3 with & without cellular vs. Series 1: Which model is right for you? The Apple Watch now has three distinct models at three separate price points, giving consumers more options than ever —but also making buying decisions more difficult. Should you get a Series 3 with cellular, without cellular, or a Series 1? AppleInsider is here to help. If you run or bike outside, odds are you listen to music while you exercise. For most runners and cyclists, that involves carrying a phone on your arm. Phones continue to get bigger, and the prospect of carrying an iPhone 8 Plus on your arm while on a 5-mile jog is not particularly enticing. Enter the Apple Watch Series 3 with cellular. If you subscribe to Apple Music or iTunes Match, the Apple Watch Series 3 with cellular is almost a no-brainer. You can leave your phone at home when you run or go to the gym, and still have access to all of your music, text messages and alerts. There are a few caveats. In addition to the $70 premium you pay for the LTE radio, you'll also have to pay your carrier $10 per month for a wearable data plan. It should also be noted that Apple Music support will come later, likely in October. 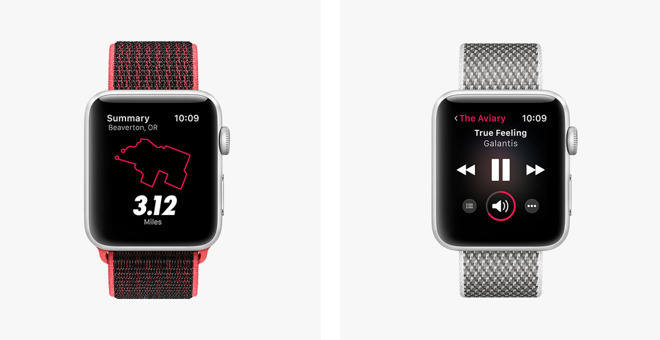 Also unknown is whether third-party music streaming apps like Spotify will (or even can) add Apple Watch support. At the moment, there isn't a Spotify app for watchOS, and it's unclear whether Apple will limit streaming capabilities for data intensive third-party apps. And you'll still need an iPhone for your Apple Watch Series 3 with cellular, even if you can leave your phone at home from time to time. The Apple Watch still requires an iPhone to set up, back up and more. If you're an athlete and you're OK with those limitations, the Apple Watch Series 3 with cellular is the best model for you. With the launch of the Apple Watch Series 3, Apple no longer sells the Series 2 model. That means if you want adequate waterproofing and swim tracking, you'll need the Series 3, as the Series 1 does not offer those features. New to the Series 3 this year is an altimeter, meaning the Apple Watch can finally track elevation separate from an iPhone. An altimeter will be particularly welcome for outdoor hikers, as well as users who want their Apple Watch to track flights climbed on an average day. 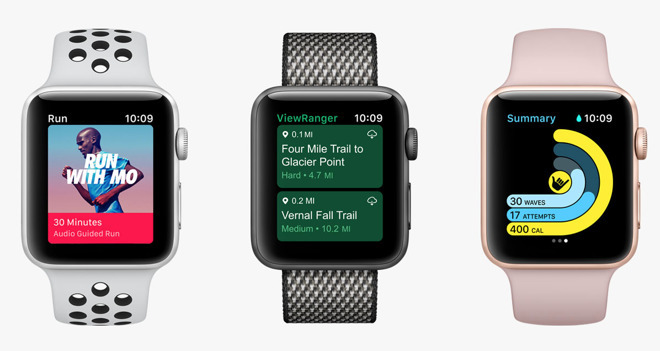 Apple has also noted that the altimeter will be appealing for skiers, with apps being updated to measure vertical distance traveled. Settling on the Series 3 is easy, but choosing whether or not to get the cellular model is tricky, because it depends somewhat on how badly you want to leave your phone behind. We think most people in this situation should still get the cellular model. For one, it comes with twice the storage at 16 gigabytes, meaning more space for locally stored music and apps. In addition, the cellular data plan is optional. So users can buy a cellular-capable Apple Watch Series 3, and add a data plan at a later date if they so choose. At $70 more than the non-cellular version, most Series 3 buyers should opt for the model with an LTE radio. 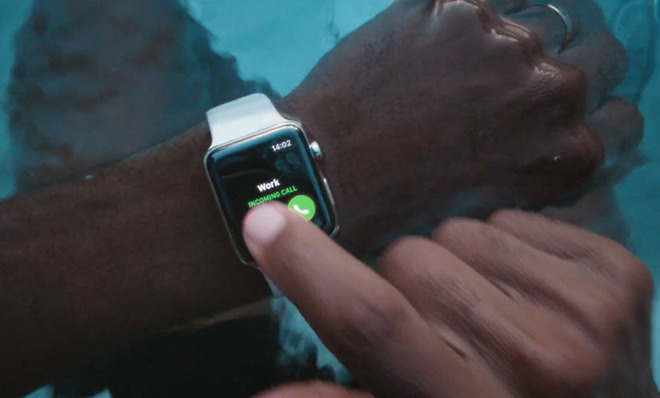 If you don't care about cellular and don't plan on swimming with your Apple Watch, the Series 1 may be a better entry point. Priced at $249, it's $80 cheaper than the non-cellular Series 3. If you go with the Series 1, you will sacrifice a faster processor, more robust waterproofing, GPS, swim tracking, the altimeter, and a brighter display. Most of those features appeal to outdoor athletes. 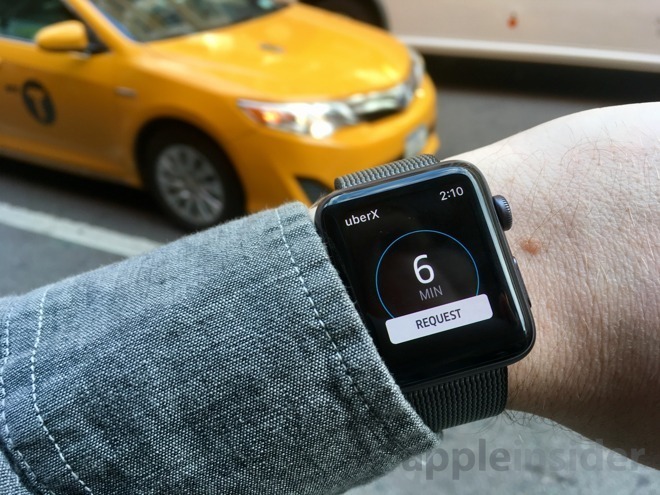 But if you're just looking for the convenience of notifications and Siri on your wrist, and you plan on always having your phone with you anyhow, you'll likely be pleased with the Apple Watch Series 1. 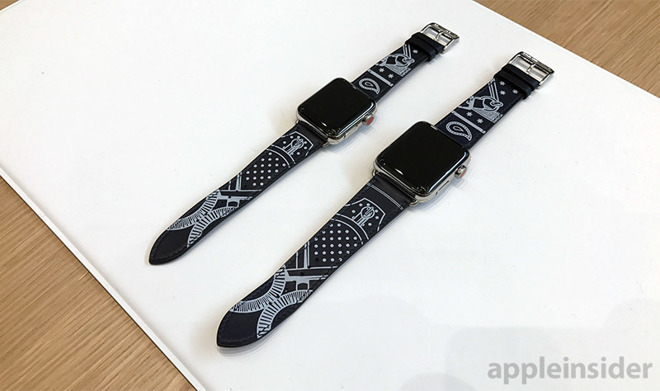 In addition, because all Apple Watch models have the same form factor, you'll be able to purchase the same bands and have the same basic look as the other models. If you bought an Apple Watch Series 2 last year for GPS, or entered into the market with the Series 1, there is not enough in the Series 3 without cellular to justify the upgrade. All you'll get is a faster processor, support for Siri to speak out loud, and the altimeter. While those are welcome upgrades, they don't really justify the $330 you'll spend, especially when the 2016 watches are all capable of adequately running watchOS 4. If you bought an Apple Watch last year and are considering an upgrade this year, you'll want to opt for the cellular model. Sure, watchOS 4 runs on the first-generation Apple Watch. But Apple's debut hardware from 2015 is showing its age, particularly with respect to speed. If you use Siri, for example, the response time is significantly faster on an Apple Watch Series 2. And that's only going to get better with the Series 3. Even the Series 1, which debuted in 2016, outright replaced the first-generation model with a new dual-core processor. That's because Apple saw how slow the first watch was, and last year felt a need to get that initial model out of its lineup. If you bought the first Apple Watch in 2015 and skipped on the 2016 refresh, now is a good time to consider an upgrade, for both speed and new capabilities. Whether you're focused on budget or connectivity, any of Apple's trio of models will be a welcome improvement. There are, of course, more options for the Apple Watch, including a Nike fitness-focused version, and Hermes branded models with leather bands. But all of these Series 3 watches include the same internal hardware. The Nike+ Apple Watch has unique bands, but they're also sold separately. The price is exactly the same as non-Nike Series 3 watches, coming in at $329 for non-cellular versions, and $399 for cellular. On the high end, the stainless steel, Hermes and ceramic Edition Apple Watches come with cellular connectivity. Internally, they are the same as the $399 Apple Watch Series 3 with cellular. Simply put, these options are a personal decision based on budget and fashion. From a technical perspective, there is nothing unique. Apple authorized reseller B&H Photo is currently taking pre-orders for the new Series 3 watches with free expedited shipping and no sales tax on orders shipped outside NY and NJ. At press time, the retailer expects to ship the devices on Sept. 25. Series 1 models are also available now with discounts of up to $15 off. *B&H will not collect sales tax on orders shipped outside NY and NJ.